In an official release, Nike has announced that it has won an interim injunction against adidas for it’s adizero Primeknit shoe. Launched back in Febraury this year, the Nike FlyKnit technology came out of nowhere and had a lot of people talking. What got people talking even more however was when adidas launched the adizero Primeknit in July. It wasn’t just punters and sneaker heads who were discussing this highly controversial occasion; the industry were also talking amongst themselves trying to figure out who, if anyone, was copying who. Well, yesterday Nike declared that they had won an interim injunction in the District Court in Nuremburg for patent infringement. As a result, adidas have been ordered to stop all manufacture and distribution of the shoe in Germany. Nike are also intending to present their case for a permanent injunction to the court. It would appear that Nike have won, or are at least getting very close. 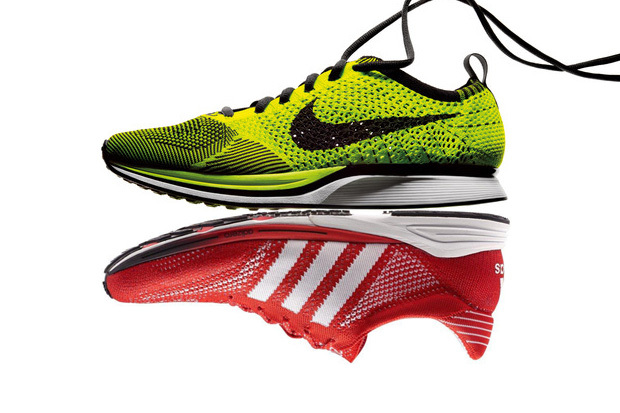 Nike have claimed to have been working on FlyKnit for at least 4 years, whereas adidas claim 3. It was the hot topic of the Summer and almost overshadowed the Olympics (depending on how seriously you take sneakers). Now, it is heating up once again. If you were fortunate enough to get a pair of Primeknit’s, you may well end up having one of the most sought after pairs of adidas ever to be made, considering that they only manufactured 2012 pairs and only sold them in the UK before this happened. What will be interesting will be the response from adidas, who had been planning to roll out their Primeknit technology into other sports very soon, including football and rugby. So with such a large focus on the technology, what will adidas do now that this partial injuction has been passed, and what will they do if Nike’s permanent injunction also gets passed? For now, it’s fascinating enough to see that Nike did indeed take legal action (although keeping it very secretive), and that it worked. This will all go down in the history books of sneakers and we shall see how it unfolds further. And they say competition breeds innovation, HA!